The labor sector will be front and center, with Friday’s Jobs Report for December the highlight. Look for the ISM Services Index on Tuesday. The first report from the jobs sector comes Wednesday with the ADP Employment Report. As usual, Weekly Initial Jobless Claims will be delivered on Thursday. Friday brings the December Jobs Report, which includes Non-farm Payrolls and the Unemployment Rate. 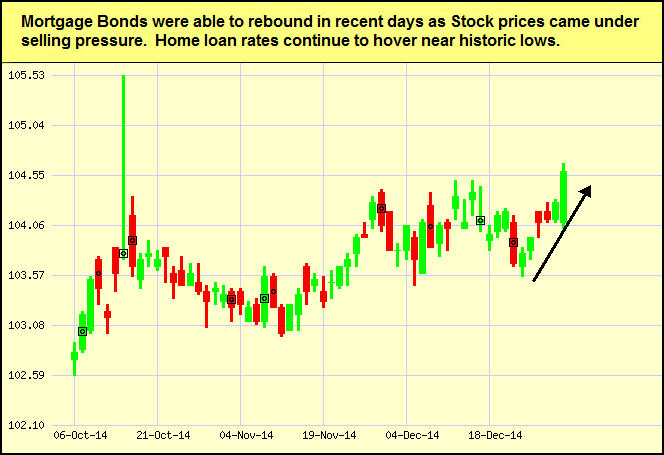 As you can see in the chart below, Mortgage Bonds have improved in recent days. Home loan rates remain near historic lows. Make some extra cash by offloading your unused electronics and devices. After the holidays is a good time to clear your home of unwanted smartphones, computers, video game consoles and other tech products. You can sell them on sites such as Gazelle.com, uSell.com and BuyMyTronics.com. Shipping is free. You will receive a check, gift card or deposit to your PayPal account. Best Buy offers gift cards in exchange for usable electronics. It also recycles unusable devices (including TVs) free. With Nextworth.com, you can take your devices to one of its partner stores, including Target, and get store credit. If you’d rather donate your old tech gadgets, you can give your cell phone to a victim of domestic violence through Verizon’s HopeLine program or support troops overseas at CellPhonesforSoldiers.com. The National Cristina Foundation will connect you with local nonprofits that will take your computer and tech accessories. And through Dell’s Reconnect program you can take computer equipment to a Goodwill location. Before you get rid of your tech gear, erase any personal data. “Deauthorize” computers that use digital rights management software (for example, products connected to iTunes, which limits some files to five devices). You should also “disassociate” your Apple ID from any device in iTunes. To delete personal data from a smartphone, reset to the factory settings and erase the SD card. For a computer, you’ll need software that erases data, such as the free Active@ KillDisk. You’ll declutter while earning cash or giving to a good cause.